Exactly one decennium after bicycling Europe North to South in 1998, this year I'm going to do a bit of serious road biking again. Not an 18 week journey with 30 kg of luggage on the bike, but going light this time, it will be high up the mountains. I want to do some of the famous Tour de France Pyrenees cols: Peyresourde, Aspin, Tourmalet and Aubisque. Yes, this will be "heavy lifting". Last time, each day I built what now would be called a blog, in 1998 it simply went by the name of "a website". :-) But this time I don't plan to spend every night in my tent writing html code, editing photo's and doing uploads. Besides the hard work on the bike, this will be a vacation. Instead of writing a blog, I plan to sit on a terrace, watch the sunset and drink a beer or a glass of wine. But to keep everybody up to date of my position and level of sweating, I will carry some high-tech gear, in this case a GPS / GSM / GPRS combination, which will do regular updates of an online map and (if all works well) that will graph the slopes I'm climbing or racing down. I don't know how much GSM coverage there will be in the mountains. And unfortunately, I won't have the hovering helicopters next to me, like the Tour de France. But for me that's of course much quieter and better. To spare you to go through hundreds of pictures, I've created a page with a nice subset of the photos that shows a lot of "me, myself and I" :-), but also how beautiful the Pyrenees are. Here are the on-line travel reports of the trip. I've put it on a separate page, because I'm too afraid that while editing my daily experiences I will screw up one of the more complex popup's on this page. For those of you who wonder about the technology behind this map, head over to LocateA.net, a tracking site which my UK buddy Alec and I have been building over the last two years. Alec developed all of the website and I wrote the software for the mobile phone with the GPS. By clicking above you will get a popup map on which you will be able to track how far I've come so far and where I've been. This map doesn't cover the first stretch from Barcelona upto the Pyrenees, but it will show the most exciting part of the trip, the "Parque Nationales des Pyrénées". Expect me 'on this map' starting around June 16-18th. The following two graphs show my ascend and descend during the Spanish and the French parts of the trip. The light blue bottom parts show the corresponding speed. The Spanish cols in the first few days included the Port de Canto (1725), the Port de la Bonaigua (with 2072 a real biggie) and on the border with France the Col de Portillion (1320). And here you have the elevation graphs for the famous French part. These included all the cols that were in 1910 part of the first Tour de France Pyrenees stage. Only difference is that those cyclists did all these cols in a single day !! On the first day I did the Peyresourde (1569) and the Aspin (1489). 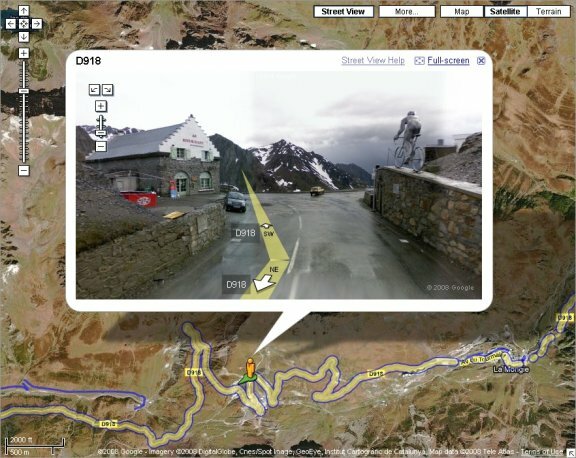 Then on the second, the HC (hors de categorie) Tourmalet (2115). On my last big mountain day, I did the Soulor (1474), which is kind of a prolog leading to the Col d'Aubisque (1709). An important decision for such a trip is of course always the bike to ride. Even with five bikes in the basement, there wasn't the right one for this trip. I needed a light bike, but with the right gears for climbing these TdF monsters. An excuse just to buy another bike? Yes and no!! After going to the bikeshop and seeing how costly bikes are nowadays, I decided I didn't want to spend that much money for just a two week trip. 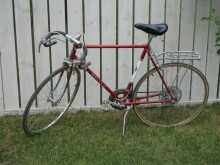 So, I went second hand and bought a 1970's Sekine bike. 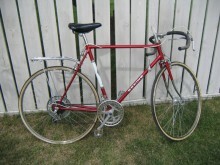 One of those all steel, 10 speed classic road bikes. My gears are 52x40 and 14-28, let's hope that that's light enough for the 10% slopes I will enounter. The good news of a cheap bike is that can even leave it behind in Spain after the trip. And if it breaks down, this will still become a nice vacation, the Pyrenees are beautiful.